The Labyrinth Program is The Montessori School’s interscholastic sports program. The teams play soccer, basketball, and participate in cross-country and races. We aim to schedule games with other schools that share our philosophical approach to sports and against whom we are evenly matched. 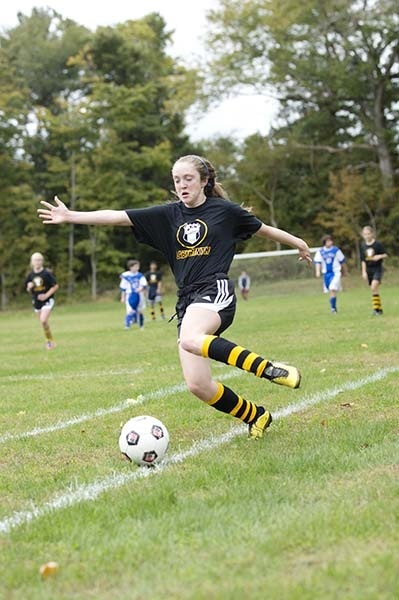 The older students play in the Fairchester Athletic League for soccer, basketball and cross-country. Every Lower through Upper Elementary student is encouraged to join our athletic program. We give every player the opportunity to improve and gain experience in the world of athletics. We encourage full and consistent participation because that is better for both the individual player and the team. On the other hand, we recognize that there are legitimate reasons for absence so players will not be penalized for missing a game or practice. Develop sportsmanship - Respect teammates, the other team and the referee. Have fun with friends and classmates. Learn to work together as a team. Challenge yourself against worthy competition. Win gracefully and lose gracefully. Be encouraging. Your presence alone communicates that clearly. Let the coach instruct the players during the game. Model good sportsmanship for your child and the community. Appreciate the other team and officials. These are the values we live with our student-athletes. We ask you to support them.